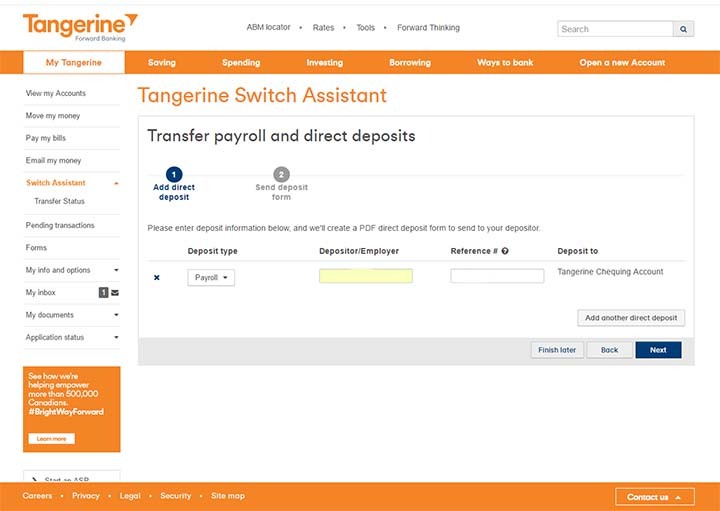 In Part 1, we started to learn the process of how to switch to Tangerine for your day to day banking. I showed how to prepare to switch banks, how to become a Tangerine client, and how to open a savings account. 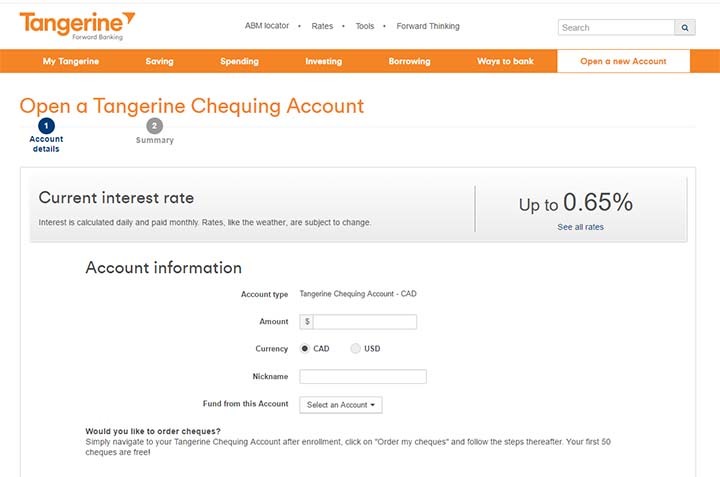 Now we’ll look at opening a new chequing account with Tangerine, and how to switch over your automatic payments. Now that you’re a client with Tangerine, with a new Savings account, it’s time to open your new chequing account. Since you have done the hard work opening the savings account, opening a chequing account is easy. 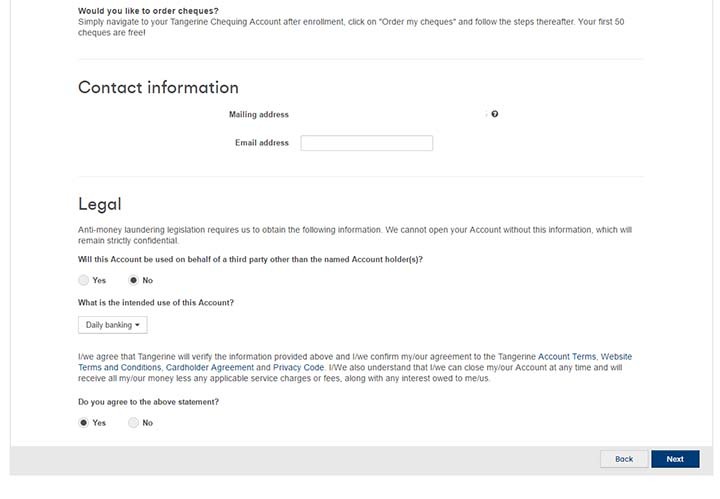 Select Tangerine Chequing Account from the “Sign Me Up” menu, and fill out the form. You will need an initial deposit again, which you can fund from either your savings, or from your current institution that you connected accounts with in Part 1. If you are funding your new chequing account from funds in the new savings account you just setup, make sure you leave enough in your savings to receive your sign-up bonuses (usually $100 minimum). After your bonuses payout, you can move that money away from your savings. Using an Orange Key when signing up as a new client will give both you and the referrer a bonus when you are making the switch to Tangerine. Bonuses change all the time, but as of writing this guide, both the referrer and new customer receive a $50 bonus with a $100 initial deposit. To order cheques, access your chequing account through the “View my Accounts” menu on the left. Then choose the “Order my cheques” option. Your first book of cheques will be free and sent to your address on file! 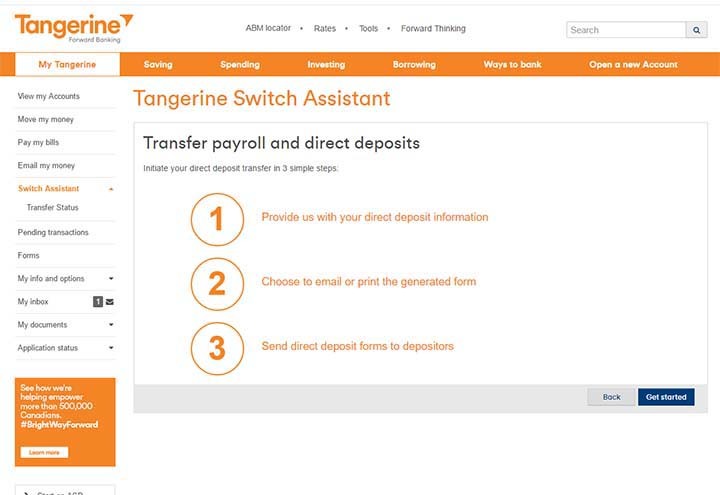 Tangerine touts their “Switch Assistant”system. It’s supposed to find automatic payments from your current banking institution and switches them over to your new Tangerine accounts. I found that this did not work nearly as good as their little “how-to” video showed. Let’s look at incoming and outgoing automatic transactions separately. Fill in the name of your employer, and your employee ID (or unique identifier used by your employer). 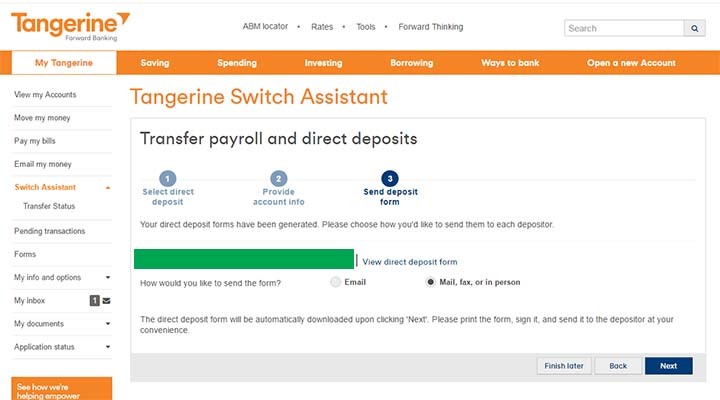 Download the direct deposit form that Tangerine creates for you in this step. You will need to print it, sign it, and provide this to your employer. This is where the Tangerine Switch Assistant didn’t work for me at all. When you select “Transfer pre-authorized bill payments” in the Switch Assistant menu, it allows you to input login information for your current banking institution, and the Switch Assistant “searches” for your current pre-authorized bill payments. Even though I had 3 pre-authorized payments setup for my old bank, the Switch Assistant could find none of them. I had to switch them all manually. I had to go to each of my pre-authorized bill payees, and provide a void cheque from my new Tangerine account. It wasn’t as simple as the Switch Assistant promised, but it didn’t take very long to update this information in person (or through email). 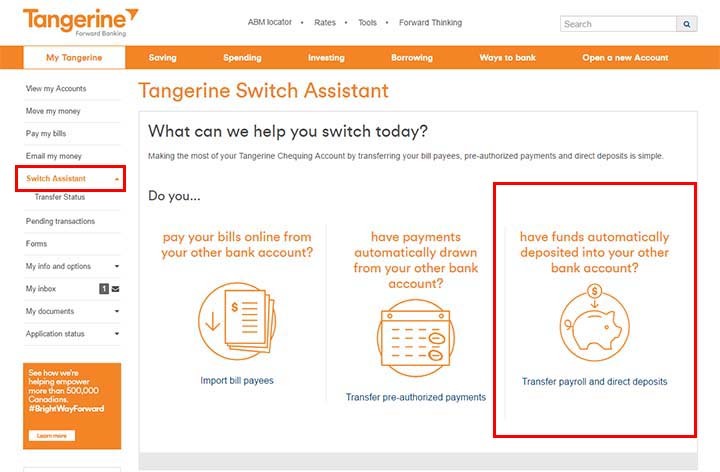 Make sure you have enough money in both your Tangerine accounts and your previous institutions accounts to cover any bill payments – the timing of switching over automatic bill payments can sometimes be unpredictable. Time to finish the process! Move the rest of your money from your old banking institution to your new Tangerine account, and close your old account to avoid paying those annoying monthly fees. 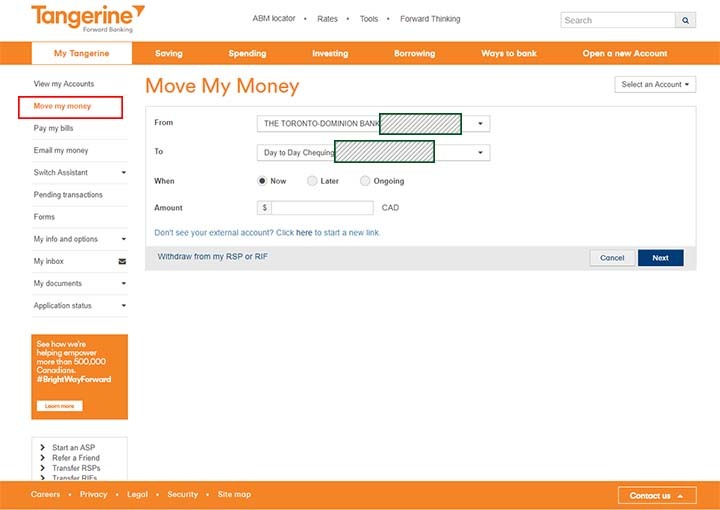 To move your money from your linked account, click on the “Move my money” option from the left menu. 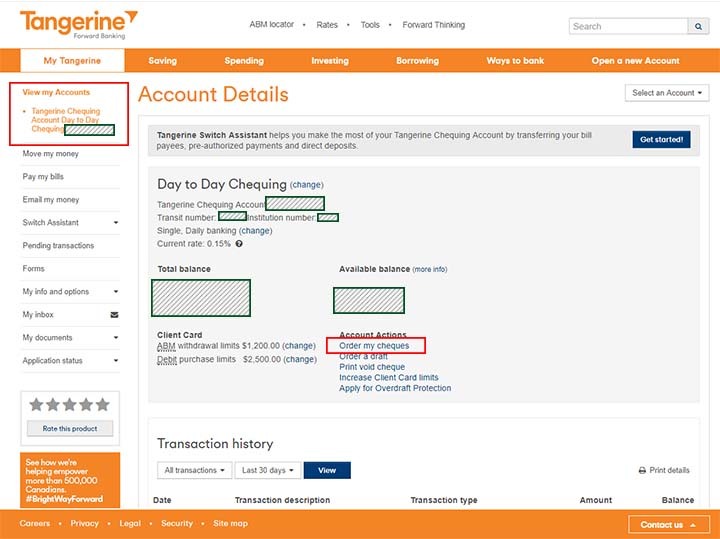 Now that you’ve linked Tangerine to your old banking institution, you can now select them in the “From” option, and then select your new chequing account in the “To” option. Once all of your money has been transferred, you will likely need to physically go to your old bank to close your chequing account. You are now on your way to banking without any monthly fees. It’s important to make sure you close your chequing account at your old bank once everything has switched over. Forgetting to do this could lead to still being charged monthly account fees, as well as penalties for not having funds to pay these fees. Good luck with your bank switch!